To test lens strength, a 150 feet per second projectile is fired at the lens. Tests are done on lenses at 24 different angles at 24 different degrees. Must pass all tests before meeting ANSI Z87 standard. Tests Include: High Mass, High Velocity, Penetration Impact Tests. High Velocity Impact Test: Must withstand impact from a 6.35 mm steel ball traveling at 150 PSI at 50 centimeters. High Mass Impact Test: Must withstand an impact from a pointed projectile (looks like a rifle shell), weighting 17.6 oz. dropped from 127 cm. Tests above: No piece of either frame or lens shall be detached from inner surface, shatter, craze, or decrease any instabilities of its function. 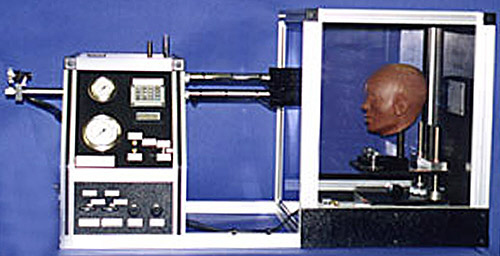 Any frame component, including the test lens, must be retained in the frame for these tests to be completed and passed. WHY IS IT IMPORTANT TO WEAR SAFETY GLASSES? To prevent this! Please don't let this happen to you. 90% off all eye injuries can be prevented through the use of eye protection. Over 2,000 eye injuries occur each day. Over 300 Million dollars lost each year. You only Have 2 Eyes, and we all know there is No Dollar Limit on losing your Eyesight. After all, your most precious sense is your EYESIGHT. 3 out of every 5 workers injured on the job last year were not wearing eye protection at the time of the accident.